Medical researcher Benedict Albensi has learned quite a bit about memory and dementia during the last 25 years. 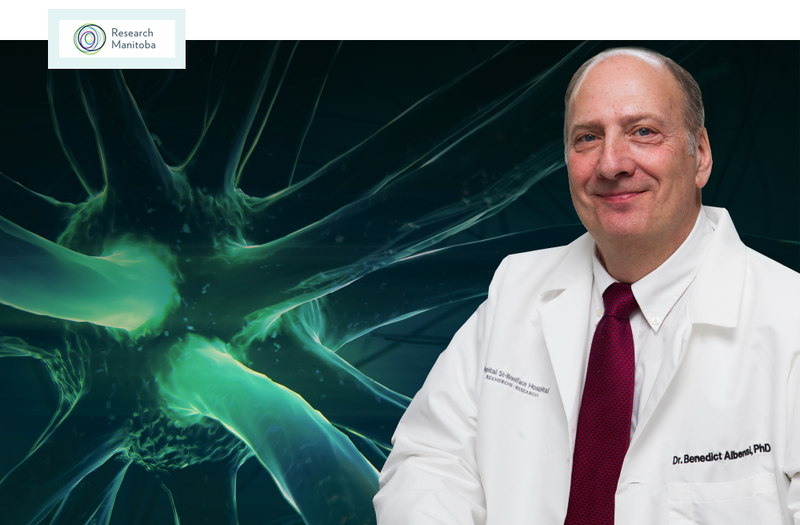 In that time, he has written, co-authored or presented more than 200 papers and talks on the subjects, worked at the famed Cleveland Clinic in Ohio, and been named Manitoba Dementia Research Chair and the Everett Fund Chair - awards that acknowledge his role as the province's lead researcher in the fight against dementia and one of the country's top scientific investigators in the field. Yet it would be a mistake to think that Albensi's knowledge of dementia is derived only from his work in the lab. In fact, much of what he knows about this disease comes from a place much closer to home. His mom has dementia, as did his aunt and uncle. As a result, Albensi knows what it is like to watch, frustrated and powerless, as a loved one struggles against the onset of chronic brain disease and the inevitable loss of independence, personality and mind function that comes with it. With his mom, the disease came about slowly at first, without any real warning. Like many elderly people, she was having trouble with names, which isn't always an indicator of dementia. Then one day she went into the hospital to deal with a heart issue. "And then she came out of the hospital, and she didn't know who I was anymore." The Albensi family is one among many that have had to confront dementia, a term used to describe a constellation of symptoms that could be caused by any number of underlying neurological illnesses, ranging from vascular dementia (stroke) to Alzheimer's disease. Millions of people worldwide are affected by this disease, including more than 22,000 in Manitoba alone, a number that could more than double over the next two decades as the population ages. Exacerbating the problem is the fact that progress against dementia has been hard to come by. To date, no cure has emerged. Moreover, no one has been able to come up with a treatment that can significantly slow its progress or alleviate its symptoms, which can include memory loss, impaired movement, anxiety, depression and paranoia. Albensi and his team of five scientists and students working out of the Division of Neurodegenerative Disorders at St. Boniface Hospital Research are hoping to change all that. 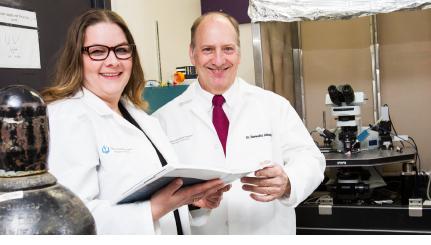 Thanks to the Manitoba Dementia Research Chair, jointly funded by the Alzheimer Society of Manitoba and Research Manitoba, and valued at $100,000 a year for five years, Albensi and his team have been able to embark on an ambitious program that touches on two main areas of research. One area involves developing a deeper understanding of the biological basis of memory, especially as it relates to the signalling pathway of a certain molecule known as nuclear factor kappa B, or NF-kB for short. The other focuses on better understanding the mechanisms that contribute to memory impairments in Alzheimer's disease. A line of inquiry currently being pursued by Albensi and his team involves coming up with ways to better differentiate among the various types of dementia, knowledge that may help pharmaceutical companies develop more effective drug treatments in the future. There are many types of dementia, and Albensi says physicians can't easily differentiate between them. Millions of people worldwide are affected by this disease. 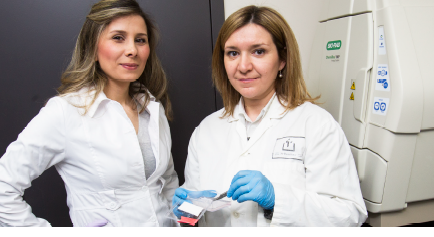 Research team members Aida Adlimoghaddam and Jelena Djordjevic prepare a western blot containing brain tissue for examination. "One of the first things physicians tell you is they don't know what type of dementia your loved one has," says Albensi, who is also a full professor in the Department of Pharmacology and Therapeutics and a core member of the Biomedical Engineering Program at the University of Manitoba. If sufferers show memory impairment, physicians can infer that perhaps the person has Alzheimer's because memory impairment is typically associated with the disease. In his mom's case, the inability to diagnose what type of dementia she has raised important questions. "From a scientific point of view, are we doing the best for her? Are we using the best drugs we can for her?" he asks. "The medications show little effectiveness right now, but even if we were a little further along, how would we even know if we were prescribing the right drug to treat her specific cause of dementia?" But to become better at diagnosing dementia's underlying causes, Albensi says a greater understanding is required of how the illness affects brain physiology, chemistry and structure. His research team's aim - as is the goal of countless other centres of investigation worldwide - is to better understand the biology of dementia in all its forms so it can be diagnosed earlier. Hopefully a deeper understanding will also lead to better treatment, and perhaps even a cure. Yet so far, understanding the disease has proven elusive. Scientists know it has pathological hallmarks - accumulations of plaques in the brain composed of a protein called beta amyloid. These proteins basically remove healthy neuron cell connections, eventually destroying sufferers' ability to function in day-to-day life. "Those are the pathological hallmarks, and we expect - and there's good reason to believe this - that the distribution of plaques in the brain will be different if you have Alzheimer's dementia versus vascular dementia [stroke]," Albensi says. In order to advance this line of inquiry, Albensi's team has been comparing samples of brain tissue from Alzheimer's dementia to samples from brains experiencing stroke (vascular dementia). What they have found is that tissue samples of vascular dementia show damage that is localized affecting only certain parts of the brain. The plaques found in samples of Alzheimer's, meanwhile, are more diffuse, though they are found with the most abundance in the hippocampus, which is a region essential for regulating memory encoding. The study documenting these differences is just one of a number that Albensi's team is preparing to publish in scientific and medical journals. Another major line of inquiry being pursued by Albensi and his team involves the role of an organelle found in almost every cell in every living creature: the mitochondrion. These are the "power plants" of the cell and, for that matter, the body. Mitochondria generate a molecule called adenosine triphosphate, or ATP. When ATP is processed, energy for the cell is utilized as a fuel. "That's what we study," he says. "We're looking at normal mitochondrial function in memory and also mitochondrial dysfunction in dementia, and we are comparing what we see in Alzheimer's to what we see from a stroke." So far, Albensi's team has been able to detect changes in mitochondria in mice way before classic dementia symptoms even show up. More importantly, they've found these changes earlier in female mice than in males - one of the first labs in the world to note this difference. While mice aren't humans by any stretch, this finding is potentially ground-breaking since 66 to 72 per cent of dementia patients in Canada are women. Moreover, if the research team's work can help with early recognition of dementia, it could spur earlier intervention, which could lead to better long-term outcomes. "If we could figure out earlier if someone has mitochondrial dysfunction, and it is related to dementia, maybe that is something that we can treat," Albensi says. In fact, his lab is looking into that possibility. Which is where the NF-kB molecule comes into play. As Albensi explains, the molecule happens to be important in inflammatory processes and immune system function. "But it also plays a central role in basic mechanisms of memory formation and recall." Of particular interest to Albensi and his team is how a compound called creatine helps modulate NF-kB. That's right. The protein powder favoured by bodybuilders could potentially be used to build up your brain matter. Albensi's team has shown that creatine affects the NF-kB molecule in mice, so the next step is testing this safe supplement on human populations. "One of the things we're doing in the lab with Alzheimer's is using compounds like creatine that improve mitochondrial function, and we have papers we're submitting right now that show creatine improves brain mitochondrial function and learning. However, in some contexts, creatine made learning worse and appears to be gender dependent, so more tests are necessary," says Albensi. "We've proposed to do that, and I'm trying to get funding to try it out on elderly patients who may be at risk for dementia," he says. "To our knowledge, there are only a few other labs that have shown roles for NF-kB in the mitochondria, so that's one of the novel things going on in our lab." 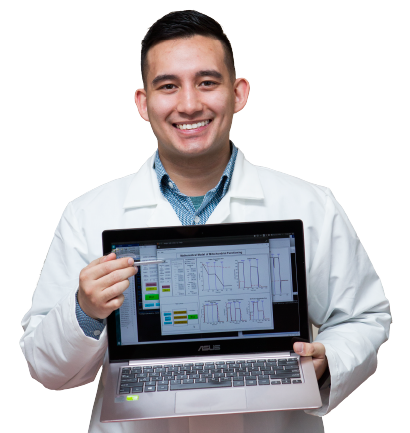 Chris Cadonic uses mathematical models to support the research team. The research team's work on NF-kB and mitochondrial function is one of the things that make the Winnipeg lab stand out from the hundreds around the world hard at work trying to unravel dementia. "To our knowledge, there are only a few other labs that have shown roles for NF-kB in the mitochondria, so that's one of the novel things going on in our lab," he says. "We want to compare the role of this molecule in the mitochondria in different types of dementia." It's this kind of work that makes Albensi and his team a huge asset to Manitoba and, for that matter, to the research community working around the world to solve the riddle of dementia, says Norma Kirkby, Program Director of the Alzheimer Society of Manitoba. "We, as a provincial organization, make contributions towards national research including [Albensi's] work here, but knowing that nationally we have been supporting this excellent work, we wanted to see their work keep going once national funding ran out," she says, explaining the impetus for the funding partnership between the Alzheimer Society and Research Manitoba. The benefits of this support are many, says Kirkby. In addition to championing important research, the Manitoba Dementia Research Chair enables Albensi to train new researchers in the field. He also meets with scientists and medical doctors regularly in a monthly "journal club" where they can discuss their work and related new work in their field, she says. "That gives them a broader view of what's happening in the research than just their area of work," says Kirkby. This is even helpful for those working towards developing better care on the front lines, providing the psychosocial support, which is, to date, the only really effective treatment. "As people are saying, 'Why can't they find the cause? Why can't they find a cure?' the health-care workers supporting individuals and families are able to say, 'They're working on it.'" Indeed, Albensi and his team are working on it. Consider the research on the NF-kB molecule, which is important because of its role in regulating inflammation. When people are injured or sick, inflammation is actually positive. It's the sign of the immune system working. "It helps you to heal," says Albensi. "But chronic inflammation is not good and it's believed to be central to cancer, and central nervous system disorders and also Alzheimer's." His team's research has also shown the NF-kB molecule is neuro-protective in neurons, and mice with dementia have altered levels of it in their brain. Complicating matters, however, is that the molecule is also important in the function of another common cell in the brain called glia. "Not only do we have nerve cells, but we have these fatty cells called glia," he says. "They play a different role and they contribute to the inflammatory response." So the thinking goes that regulating NF-kB to reduce inflammation in neurons could have a different impact - a negative one - in the glia cells, which insulate neurons, provide them with nutrients, and clean up waste. The discovery is both exhilarating and frustrating as it leads to even more questions that must be pursued. Given the enormity of the challenge, Albensi says it is important to remember that the research being carried out by his team is part of a larger puzzle that a global community of researchers are trying to put together. He likens dementia research today to investigations into cancer a few decades ago. "When I was a kid, cancer was like a death sentence, and we didn't discriminate amongst different types of cancer very well, and now we do," he says, adding treatment and survival rates have greatly improved over the years. "I think dementia [research] is sort of the same way." The research being carried out by Albensi and his team is moving us incrementally closer to that day when dementia is no longer a mystery. More importantly, their work may eventually help usher in a new era - a time when this devastating disease is not just treatable, but curable.